After having my fill at Papaya King, it was time to try out its closest competitor: Gray's Papaya. Gray's has three locations in Manhattan, with the one on 6th Ave being the original I'm told. The original Gray's Papaya was started by Papaya King partner Nicholas Gray as a copy of the King in 1972. Gray's Papaya was quite a trek from Papaya King, and we ended up taking the 4/5/6-Lexington Avenue line to the F-Sixth Avenue line. 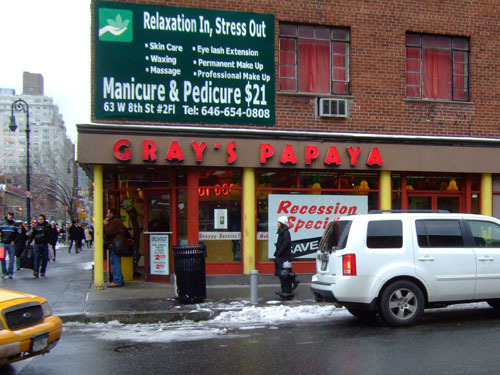 From there, Gray's Papaya was a quick walk from the W 4th St Station. 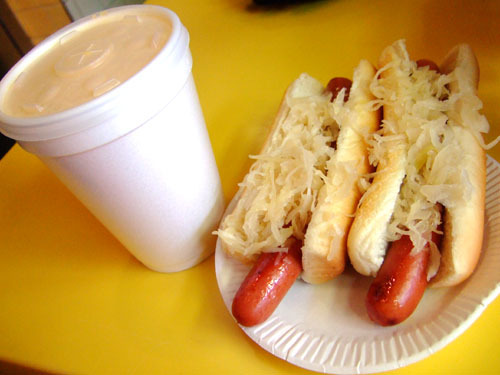 Gray's Papaya is most well-known for its "Recession Special," consisting of two frankfurters and a drink. The combo was priced at $1.95 throughout most of the 1990's, but increased in cost in 2002 and 2006. In any case, as with Papaya King, Gray's also uses a Sabrett-sourced dog, and thus unsurprisingly, the frankfurter was similar to the King's in flavor, though the casing didn't have as much snap. In terms of cooking, the two places seem to use a similar method, and I didn't notice much difference in the sauerkraut or the mustard toppings. And as with Papaya King, the bun wasn't as grilled as much as I would've liked. In terms of drinks, Gray's has a similar flavor variety to Papaya King--Orange, Grape, Piña Colada, Coconut Champagne, and Banana Daiquiri--but again, we decided to go with papaya to have a common basis for comparison. The taste was rather similar between the two, but the drink here was much thinner in consistency and not as rich or creamy, but with perhaps a bit more fruit. We preferred the King's. So in this Papaya battle, I'd have to cede victory to the King, due to its snappier hot dog casing and creamier drink. However, given that there are multiple locations of each restaurant, and further day-to-day variations amongst those, the Papaya war is far from over. And given more time and more stomach capacity, I would've liked to have thrown Papaya Dog into the mix as well, or even Nathan's. The issue of who's top dog is still under contention. 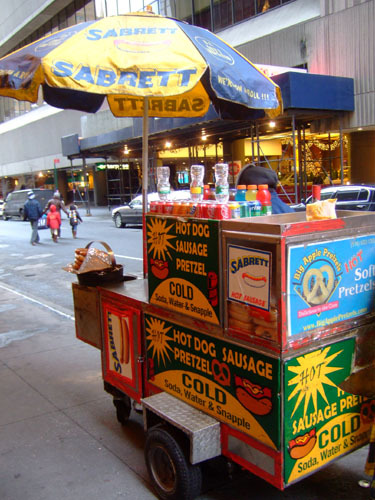 Since Gray's Papaya and Papaya King both use frankfurters sourced from Sabrett, we thought it'd be fitting to try a dog from a Sabrett street vendor. These dogs are affectionately known as "dirty water dogs" due to the fact that they're cooked in pools of water before serving. This particular cart was located on the southwest corner of 7th and 45th in Midtown Manhattan. 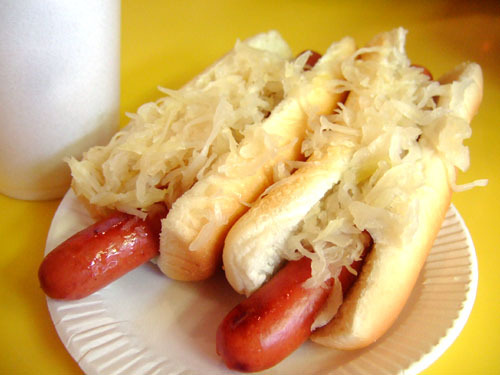 As before, I had my frankfurter topped with kraut. Not surprisingly, the taste was again very similar to what I had at Gray's Papaya and Papaya King. The difference here was the texture of the casing. It lacked any snap or crunch, and blended into the body of the hot dog itself. I suspect this was because of the "dirty water" cooking method, as the dogs are not grilled. 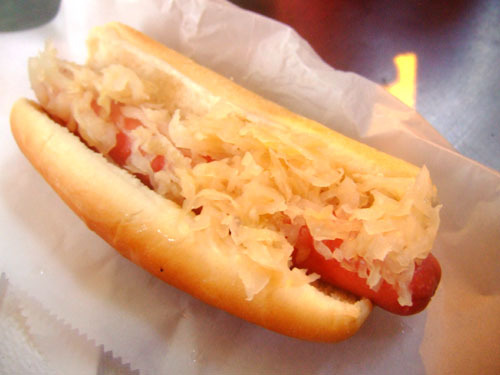 The sauerkraut was also somewhat mushier, though still tart and tangy in flavor. The price of admission was $2.00 per, considerably more than a single dog at either of the Papayas. Considering it wasn't as tasty as either of those, I guess you do pay a price for convenience and instant gratification. I think the combo at Gray's when I went in 2004 was $2.75. If I went to NYU or Columbia, I probably would've gotten it four times a week. When I was at undergrad here in LA, I went to Pink's about once a week. Yeah we all have a places like Pink's. I remember a few restaurants that I used to visit constantly when I was an undergrad at Cal. It was actually from these experiences that my foodie sense began to develop. i never had a hot dog besides as a kid..til hunger took over at a dodger game a few years back. then had a pinks hot dog at work the other day. must say...not impressed at all. a hot dog must have the condiments do the work...not the other way around. long live the burger! Paul, I think Dodger Dogs and Pink's are fairly solid, but the ones I had in NY were able to stand on their own perhaps a bit better. booo kevin. just the ground beef in a burger is delicious. not to mention adding spices, chopped onions, blue cheese and then grilling it. bam! i am getting hungry just thinking of it and i ate at fogo today. damn that new years resolution! Agree about the Chicago dog though!